Brock Duffey winds up to deliver a pitch during his start against the Giants on July 14. 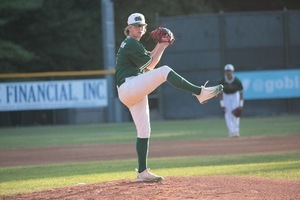 While defensive errors plagued the Bethesda Big Train (31-5), the offense proved stronger in their 5-3 win over the Gaithersburg Giants (20-16) on July 14. An error and single in the top of the third combined to put the Giants on the board first, with the 1-0 lead heading into the bottom of the third. That lead didn’t last long, however. After Tyler Reis (Waynesburg) and Fox Semones (James Madison) hit back-to-back singles to start, a one-out grounder to short from Carson Taylor (VA Tech) resulted in a Giants error and drove in two runs. Then, a fielder’s choice and a walk put runners on first and second for Jacob Southern (Jacksonville). Alec Burleson (East Carolina) made it home on an overthrow at third from the Giants’ catcher, then a single from Southern—who worked a full count and fouled-off four pitches—drove home Justin Wylie (Arizona) from second, giving the Big Train a 4-1 lead at the end of the inning. The Giants threatened in the top of the fifth, with a leadoff single off Big Train reliever Chris Clarke (Southern California). Clarke gave up a double later in the inning but struck out three to hold Gaithersburg to the one run. But two innings later, the Giants tacked on one more run, after another leadoff single followed by a passed ball and one-out single to center field drove in a run. Brock Guffey (Alabama), the Big Train’s starter, pitched a full four innings, holding the Giants to the one run on two hits and two walks, striking out two. Clarke struck out four in his two innings of work, and Ryan Metz (VA Tech) struck out one and gave up one run in one inning of work. In the top of the eighth Gavin Hinchliffe set Bethesda up to add a fifth run in the bottom of the inning, with a three-up three-down top half including two strikeouts. That fifth run came after Reis walked with bases loaded, driving in Southern to give the Big Train the 5-2 lead. That insurance run proved worthwhile, as the Giants scored one run in the top of the ninth after a leadoff walk, then back-to-back errors. But closer Jacob McCarvel (Cal Baptist) got Bethesda out of the inning, earning the save and striking out two to give the Big Train the 5-3 win. The Big Train hit the road Sunday to take on the Loudoun Riverdogs at Rock Ridge High School. First pitch is set for noon.